Islam Around Us: Indian Consulate in Afghanistan attacked, 4 gunmen killed. 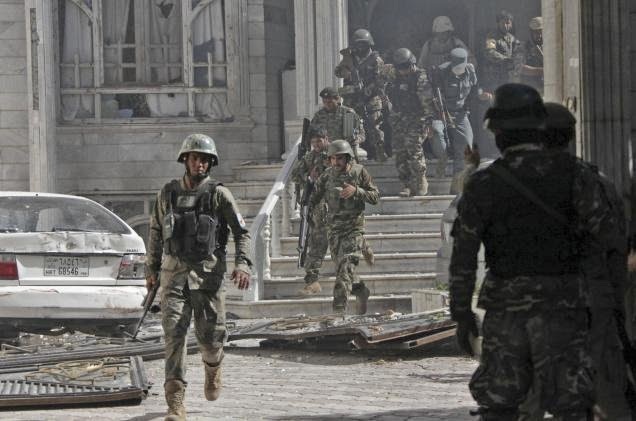 Indian Consulate in Afghanistan attacked, 4 gunmen killed. The Hindu | AP |24 May 2014 : : The Indian consulate in Herat in Afghanistan was attacked on Friday by four heavily armed gunmen who tried to enter the complex. All four attackers were killed, officials said, adding that the Consulate staff were safe. The attack began at 3.15 a.m. when the four gunmen tried to break into the consulate, located 600 km from Kabul. Earlier reports had indicated the involvement of three gunmen. The audacious attack comes ahead of the May 26 swearing-in ceremony of Narendra Modi as India’s next prime minister. Afghan President Hamid Karzai has confirmed that he will attend the oath-taking ceremony. “The attempt was thwarted by the staff of the (ITBP) Indo-Tibetan Border Police, who were joined by the Afghan security forces,” said Mr. Akbaruddin providing the latest update on the situation. He said that Mr. Modi had spoken with Indian Ambassador Amar Sinha and bolstered the morale of the Indian staff there. Indian Foreign Secretary Sujatha Singh is monitoring the situation and is in touch with her counterpart in Afghanistan, said Mr. Akbaruddin. “We are glad to tell that all Indian personnel remain safe. We have rechecked that while the situation remains uncertain, there is no threat to the Indian staff,” he added. Shaida M. Abdali, the Afghan Ambassador to India, told TIMES NOW TV channel in New Delhi that all four gunmen had been killed. Mr. Abdali described it as a terror attack. “This attack can only embolden our determination that we will keep this friendship at all costs,” he said. “But in the meantime, Afghan forces joined the operation and gunned down the other three attackers,” the official added. The area has been cordoned off. China launches crackdown after bombing kills 43. New attacks in Iraq kill 5 Sunni militiamen. Four Libyan soldiers killed in Benghazi attacks. More chaos as Kashmiris boycott India polls. Taliban leaders establish new political movement. Twin blasts hit train at Chennai station.